This is our haven for our favorite characters. We mostly have the same tastes, but sometimes we don't. Anyway, do you love these characters, too, or what? Juat a note: Some of these characters have pages, some don't. When other people can create whole websites centered around a character, do you think that we could accurately portray everybody in the little space we are given? 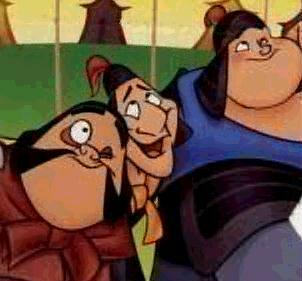 Remember these three guys from Mulan? From left to right: Yao, Ling, and Chien Po. They are so cool! Yao has a bad temper, Ling is a sweetheart, and Chien Po is the inner-peace guru. Gotta love them! This is Basil from the Great Mouse Detective. He's sooo smart! Tealin just thinks Meg is the best! Of course, these are the Warner Brothers! & the Warner Sister! 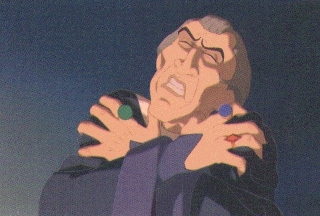 This is Clopin, the best character in Hunchback of Notre Dame. Isn't he just adorable? Tealin, I'm just kidding, and you know it! This is Mr. Timon Meerkat from the Lion King. You have to admit, he is cuddly! But I wouldn't buy a used car from him! Mulan and Mushu (from Mulan, of course) are so cool, don't you think?